The delight of a church like St Mary’s Abergavenny is the layers of history that it represents in tangible form. As you wander round, you move from the twelfth to the 20th century, and now this project will add a further layer to the centuries, in this exciting project of commemoration, restoration and brand-new beauty. I think of a building like the Priory church as a historical echo-chamber. An echo-chamber has the effect of amplifying, by taking a sound and throwing it backwards and forwards until it becomes something new and greater. The echoes here are of centuries of history in conversation with each other: a lively conversation, which is still in progress. The very name we give the Lewis Chapel illustrates the echo effect. When David Lewis was buried in it in 1584, that north part of the Priory church was already a venerable sacred space. Lewis’s monument is glorious enough, but more than a century older is the unique glory in the Priory, the reclining statue of Jesse, part of a truly stupendous composition, the genealogy of Christ stemming as a tree from Jesse’s figure. That is where one of our echoes from century to century comes in, because at the heart of all that is being done in the Lewis chapel is the glass which will seek in the idiom of our own day to complement the Jesse statue while calling to our remembrance Fr Jeremy Winston and his much-valued ministry, so sadly cut short. So many different achievements beautifully linked together: a true harmony of history. David Lewis would have known the Jesse composition well when it was still complete, and we know this because we know with certainty that he habitually sat close to it when he came to church. He made his will exactly a month before his death in 1584, and he asked to be buried in the parish church at Abergavenny, ‘where I was wont to kneel’, in the tomb he had prepared for himself. So this was a very careful piece of planning; this super-efficient lawyer had left nothing to chance, particularly the chance that his executors might not carry out some of his wishes, all too frequent a circumstance in the history of will-making. He sorted it all out in his lifetime. So it was easy for David Lewis’s friend the poet Thomas Churchyard to make graceful references to it in his great poem The Worthines of Wales, a sort of pioneering Pevsner’s ‘Buildings of Wales’ in verse. That dates from only three years after Lewis’s death: 1587. When man his race hath run. And there was reason for gloom in a man who loved history: as he noted, Abergavenny Castle was already in ruins, and ‘the most famous work of … the root of Jesse’ was already ‘defaced and pulled down in pieces’. So given the timespan from 1587 over more than four centuries, it is an amazing piece of luck that we still have the figure of Jesse, now so beautifully restored as part of all the work that is being done. It’s an act which takes its place amid all the deeply affectionate acts of restoration over the centuries. The crucial one happened during the lifetime of David Lewis and was directly connected to his family. St Mary’s was so much cherished by the people of Abergavenny that they gave over their own parish church to move into the church of the Benedictine monks and save it from the ruin that so many monasteries suffered in the Tudor age. Fr Mark in a copy of robes depicted in Dr Lewis’ tomb. Around 1580, Lewis himself planned his tomb in the rescued Priory Church, and he had it put in position before his death in the part of the church where so recently the Jesse tree had loomed over the altar. He commissioned the tomb from the best sculptor in the Welsh Borders in his day, John Gilden of Hereford. If you go to another stately church across the border, Bosbury in the shadow of the Malvern Hills, you will see another of Gilden’s compositions no more than half a dozen or so years older than Lewis’s tomb; it’s a memorial to a Protestant church official of the diocese of Hereford called John Harford. He was a generation older than Lewis, but they were in the same line of business, civil law and church administration, and they would have known each other well. Harford’s tomb is quite astonishingly avant-garde for 1573: if Herefordshire stone had been of a different and frankly a better quality, you could have looked at it, blinked and thought you were in Italy. Lewis no doubt did go to Bosbury and have a look at it, and decided to have something more traditional in shape, but still, in his own English altar tomb, you see up-to-date Italian architecture in every detail. He lies there in his doctor’s robes, and he makes no pretensions at being a fierce man of war like the Herberts in their tombs across the way in the south chapel of the church. Instead of a helmet from a suit of armour, his head is resting on two books, the tools of his trade as a professional man and a lawyer. What are these books? It’s easy to think that they are Protestant books to suit this pillar of a Protestant government, so we might think that they are the English Bible and the Book of Common Prayer. Well, maybe, but there is no inscription on them to tell us. Perhaps they are lawbooks, maybe they are part of his own personal library of which he was evidently proud, for he described its contents in his will: books of divinity, philosophy, history and art as well as law. Lewis’s career suggests that he made a habit of not revealing quite what he thought about religion. Let’s look at some details of that career, and we will see David Lewis slipping deftly through all the thorny thickets of the Reformation. First we can start with David’s parentage. He was of modest Welsh gentry stock; his father was Lewis ap John ap Gwilym ap Robert Wallis. David followed the Welsh custom and called himself ap Lewis, to show that he was his father’s son, rather than that surname Wallis, which, after all, I guess is just an English description for a Welshman. So here is a proud son of Wales, as we might also gauge from the fact that after all his years in Oxford and London, he chose to be buried so prominently back in the town of his childhood. We can work back from the fact that David became a Bachelor of Civil Law in Oxford in 1541 to say that he was probably born in the mid 15-teens, for a BCL would normally be in his mid-twenties. Henry VIII was then still a young man, a faithful son of the Pope and a sort-of faithful husband to Katherine of Aragon, and Martin Luther had probably not yet said anything which would cause the Reformation. Lewis’s life would span a great trauma in religion and politics. By the time of his death, the English government saw the Pope as its greatest enemy, and countless beautiful things like the Abergavenny Tree of Jesse had been destroyed in the name of religion. But by the beginning of the 1540s, David’s father Lewis ap John Wallis was intimately involved in rescuing the town from the trauma of the dissolution of the monasteries: he helped set up the Grammar School in the name of Henry VIII which probably replaced whatever school the town had had in the time of the Priory. Later he would actually be vicar of the parish of Abergavenny, which now worshipped in the Priory church. There is a bit of a mystery here in terms of timing. Lewis may not have been an ordained clergyman until it was legally possible for clergy to marry, which means after the death of Henry VIII in 1547. I know that the Welsh clergy had never been that keen on celibacy even before the Reformation, but I don’t see how in Henry’s reign such a prominent clergyman as a vicar of Abergavenny could have ignored the fact that he was married with a son in his thirties. Meanwhile David’s own career had taken him to Oxford, and a Fellowship of All Souls’ College. That was predictable for a Welsh lawyer at the time, and also showed that he was going into a specialist form of law, civil law, which was a prime concern of All Souls’ then and later. Civil law was specialist because it dealt with two fields of law which might seem very far separated to us: international commercial law and the law of the Church. What connected them was first that they were both international, and they both derived from the law of the great multinational state of the past, the Roman Empire: that is why civil law was so different from the local customary law of England, which we call common law. 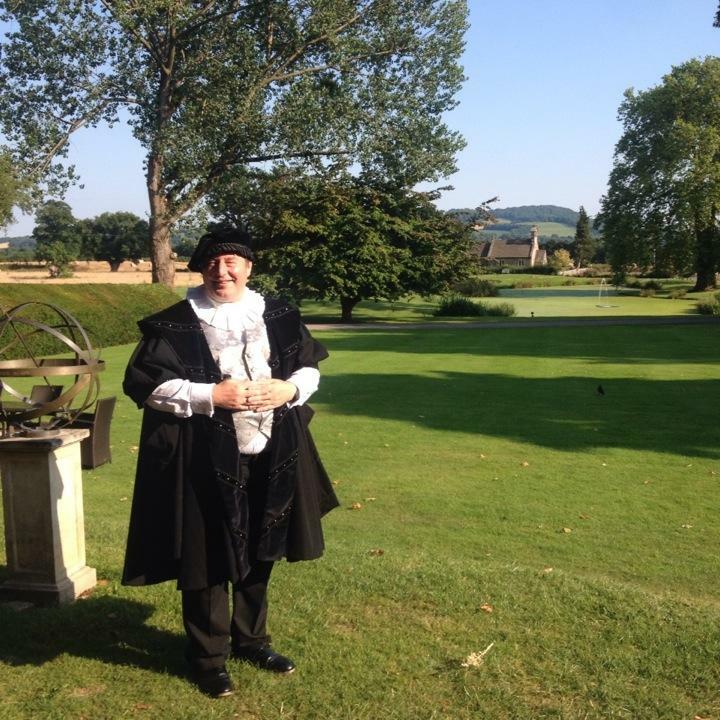 The second reason for the connection, thanks to Henry VIII’s break with Rome and his suspicion of everything to do with the Pope, was that it was no longer possible to study church law in the English universities, Oxford and Cambridge. So if you wanted to practice in the Church courts in Colleges like All Souls, from exactly the time when young David was beginning to specialise in his studies in Oxford in the mid-1530s, you would have to study civil law, not the law of the Church. That is what David did. It was a recipe for making big money, even bigger than most ordinary senior lawyers. It was the equivalent in terms of earning power of hedge fund management today. And it has to be said that being a civil lawyer had some of the same rather detached quality about it as international finance now: civil lawyers tended not to involve themselves with the religious passions that were swirling around Europe in the time of the Reformation. They kept their counsel, made their judgements and generally did rather well in terms of hard cash. From the early 1540s David Lewis’s career ticked all the boxes that you would in this very specialist world. For a while he stuck to University administration, becoming head of a little university community in Oxford called New Inn Hall, whose ruins you can still see just behind the Union society, in New Inn Hall Street. Older members of the Hall in his time would remember that that this was where the great international scholar Erasmus had stayed during his time in Oxford. After that, around the time that Henry died and his Protestant son Edward became King, David Lewis moved into legal jobs in London which would lead to the top positions in civil law. He operated in those royal courts at Westminster whose procedures were influenced by civil law; these were the Court of Chancery and the Court of Requests. He also looked after various bits of church administration, and finally after Queen Elizabeth restored the Reformation to England in 1558 he rose to be the Chief Judge in the Court of Admiralty. This was the top national institution dealing with international law, naturally, because that was the law of the sea. So it was under Protestant Queen Elizabeth that his career really flourished. In the middle of all this, Lewis played a crucial role in an institution which was of huge significance in the future of Wales and Welsh religion, Jesus College Oxford. When it was founded in 1571, he was named as its first Principal. He didn’t stay long, perhaps no more than a year, and that may have been the idea. 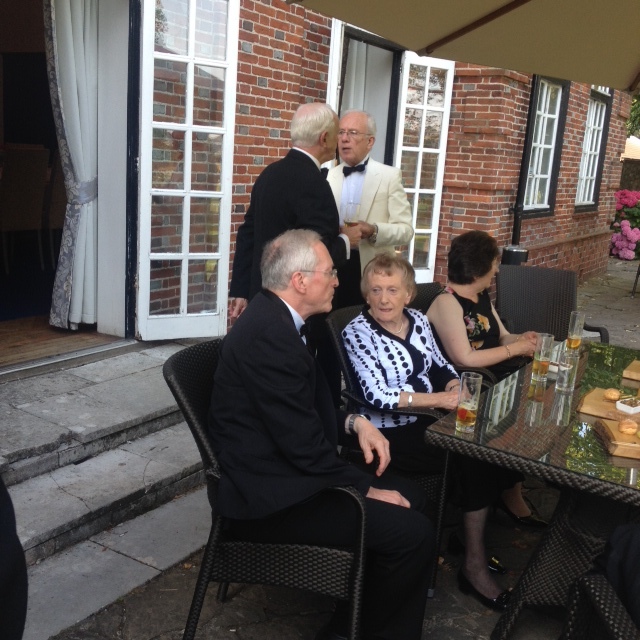 The formal founder was the Queen, but that was just a piece of PR: the energy and inspiration came from a Welsh clergyman, Hugh Price or ap Rees, from Brecon, yet another Oxford civil lawyer, a couple of decades older than David Lewis. Like Lewis, Price remained a bachelor, but in every other respect than clerical celibacy, he seems a convinced Protestant clergyman, and the idea was to train Protestant clergy for Wales. This was a brand-new foundation with a very distinctively Welsh set of origins, and I think that David Lewis may have been brought in as a safe pair of hands, to make sure that it got off the ground. And it did. A safe pair of hands: the whole of Lewis’s career shouts that out. So he was equally trusted by Catholic Queen Mary Tudor and her Protestant successor, her half-sister Elizabeth. In Queen Mary’s first parliament, which officially restored Roman Catholicism to England, he was an MP far from Wales in Surrey, in a borough (Steyning) which was notoriously a way for royal civil servants to have a place in the House of Commons. In her third parliament, he was back to his native country, as one of the two shire MPs for Monmouthshire, one of the few times that it didn’t have a member of the Herbert family as a county MP. Strikingly, he was also one of the judges whom Queen Mary named to the heresy trial of the great Protestant martyr Archbishop Thomas Cranmer, though he seems interestingly absent and silent in all the remaining accounts of what happened. A safe pair of hands, but also definitely not loudly Roman Catholic. That was useful for Lewis when the world changed back to Protestantism. So Lewis doesn’t shout out his religious faith to us. It’s not at all noisy in his will: there is still that two-edged quality which we keep finding, for his family went in two different directions. Lewis left property to his sister Maud Baker, whose son was his godson, and so the boy was also called David; but this David Baker was to become one of the most distinguished of a new post-Dissolution generation of English Benedictine monks, taking the name Augustine in the religious life. So Augustine Baker stepped away from the Reformation, but there was more family in David Lewis’s will. He left all his library apart from his law books to a nephew William Pritchard, who was emphatically a Protestant, and indeed a Protestant clergyman: he became a canon of St. Paul’s Cathedral. The generation after David Lewis were making much harder-edged choices than Lewis made. So what is the significance of this story of Lewis? Those two protégés of his, his godson and his nephew, represent the two possible futures for Welsh culture: Catholic or Protestant. Lewis doesn’t seem to have given them any heroic sense of direction. But I think that his contribution was to be part of that sense which was now destined to spread through Wales that English opportunity was fully open to Welsh talent. And in the future, that meant English Protestant opportunity. A Welshman could be a Fellow of All Souls, and make fabulous money in that most lucrative professions, the law. The significance of Jesus College Oxford, in which Lewis played his crucial role, was that it gave Welshmen a route into the heart of the English establishment, even more decisively than All Souls had done before it. The big contrast is with Ireland, another Celtic culture with a long and untidy relationship to England. Henry VIII and his governments tried to play the same trick in both countries, moulding their institutions to be like England and offering them the hint that they could enjoy English privileges. So Thomas Cromwell constructed shires in Wales like those of England and gave Welsh seats in the Westminster Parliament, where previously they had had no representation. He and his successors as Tudor government ministers equally gave Irish chieftains English-style titles as Earls and Barons, hoping to change them into English noblemen. So for a moment in the 1530s and 1540s, it was possible that Wales and Ireland might have similar futures. An Irish College in Oxford, an equivalent to Jesus College, might have swayed the balance to closer relationships with England, but there was none. Instead the English government and English settlers robbed the native Irish of land and dignity, and did virtually nothing to preach Protestant religion in the Gaelic language. When Elizabeth I eventually founded Trinity College, Dublin, right at the end of her reign, around thirty years after Jesus College, Oxford, it was too late. Irish gentry had by then overwhelmingly decided to reject Queen Elizabeth’s religion, seeing it simply as an instrument of English colonialism, and they were not going to send their sons to be turned into Protestants at Trinity. By contrast, the Welsh took Protestantism to their hearts and made it the vehicle of their culture. There were two vital stages in this: first, there were just a few Welshmen who took up Protestantism in a much more vocal way than David Lewis and his clergyman father. Curiously, one neglected source of this was a place very far away from Wales: Calais. It was the last fragment of England’s medieval empire in mainland Europe, English right up to 1558. The point about Calais was that it needed defending against the French, as its loss in 1558 showed only too well! Calais was home to one of the very few permanent garrisons of royal soldiers in all the Tudor dominions; otherwise the Tudors had no standing army at all. And a significant number of those soldiers in the Calais garrison were Welshmen. I think of the soldier Ellys Gruffuth, who has bequeathed us a fascinating chronicle of life in Calais and Tudor England from the 1520s to the 1540s – in Welsh; it survives in the the National Library of Wales in Aberystwyth. Gruffuth was a fervent Protestant, who celebrated the Reformation and detested Catholicism, and he was not unique. Men like him were placed by their military career in the gateway to England from the rest of Europe. When they came home to sheltered, remote Wales, they brought back new religious ideas, along with their savings and French souvenirs (maybe even a taste for garlic). It’s significant that many of these first Welsh Protestant activists were laypeople, not clergy. I think of David Lewis’s Oxford contemporary John Salesbury, a Denbighshire gentleman and a hanger-on of Thomas Cromwell, who produced the first English-Welsh dictionary and was the first Reformation translator into Welsh of the Bible and Prayer Book – difficult, idiosyncratic Welsh, but he tried. Repeatedly the Bible has come to mean salvation to a particular people or cultural grouping by saving not merely their souls, but their language, and hence their very identity. So it was for the people of Wales, through the Bible published for the first time in good literary Welsh by the Protestant Bishop William Morgan in 1588. It was done with the encouragement of the Archbishop of Canterbury, an Englishman from Lincolnshire). This publication of 1588 was a great improvement on Salesbury’s pioneering efforts. Morgan’s Bible preserved the special character of Welsh culture in the face of the superior resources and colonial self-confidence of the English, and it also ensured, against all likelihood in the earlier years of the English and Welsh Reformation, that the religious expression of the Welsh became overwhelmingly Protestant. The BCP in Welsh was also a publishing success: there were six different printings up to 1640. This was a total contrast to Ireland. Another great contrast were the sort of people whom Queen Elizabeth appointed bishops in the two countries: in Ireland, it was increasingly Englishmen, and certainly speakers of English and not Gaelic. In Wales 13 out of 16 Elizabethan Welsh bishops were native Welshmen, so naturally Welsh-speaking, and among these was of course William Morgan. At a time when the Welsh bardic tradition was in decline, apologists for official Protestantism provided a lifeline for the survival of the language. The Welsh Protestant Church was as poor as the Irish Protestant established Church, and almost as chaotic: but one Church became a vehicle for national culture, while the other became a chaplaincy for an exploitative colonial elite. While around him this Protestant cultural activity gradually took shape, and others toiled and wrote, David Lewis kept his counsel. If he had chosen a motto, it might have been a later line of poetry from a rather more heroic figure, John Milton, who wrote in one of his most sublime poems, ‘On his blindness’, that ‘They also serve, who only stand and wait’. Lewis gave a quiet example to his fellow-Welsh that a Welshman could be a success in the realm of the Tudors. He was one of the key figures in creating an institution of higher education in Oxford which went on making that prospect a reality for countless young Welshmen in the years where Tudor England turned into the hub of a world empire. But three centuries before Britannia ruled the waves, with many a son of Wales sitting beside her, David Lewis had commissioned his grand tomb in Abergavenny which was already a symbol that Wales was connected to an international culture. It was a little taste of Italy in a Welsh valley, thanks to the sculpture of John Gilden of Hereford. And there, amid all the echoes of our historical echo-chamber, is probably the echo we least expected. 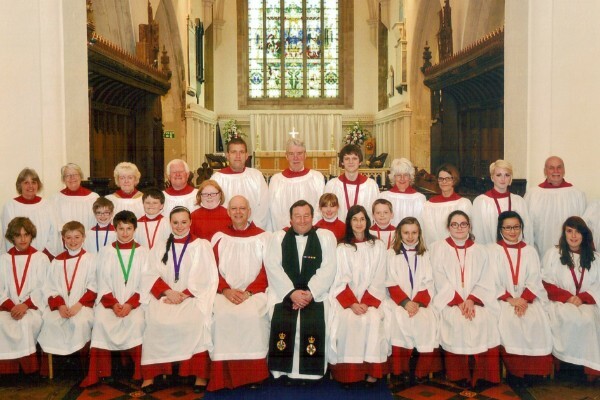 Last year the Choir sung the service at Coventry Cathedral for a week and the year before they visited Gloucester Cathedral. 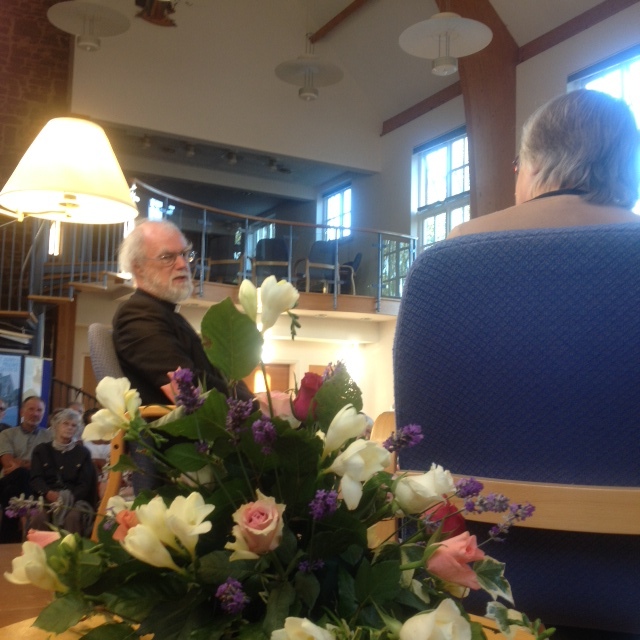 CHEESE, college life, the plight of the homeless and life as the Archbishop of Canterbury were all on the menu in Abergavenny on Wednesday evening at An Evening with Rowan Williams. The event, organised by St Mary’s Priory Church, began with a conversation between Bishop Rowan and Caroline Woollard, former production editor of the Argus, before the Bishop fielded questions from members of the audience. The Bishop spoke about growing up in Swansea and the realisation at quite an early age that he was being called to the ordained ministry. The church was so much part of his life, he said, that it seemed that is where he should be. But academia beckoned before ordination and the teenager from Swansea went up to Cambridge – a culture shock, to say the least, he said. It was made all the easier, however, because there were four or five of them from Swansea who all went to Cambridge at the same time, so there was a support network. That concern for the homeless has been with the Bishop ever since – in both a prayerful and practical way. It manifested itself while he was in his second year at Cambridge, when a group of students decided to set up a hostel for the homeless. “We didn’t know what we were doing, but it seemed to be OK,” he said with a wry smile. Getting involved in life outside college is something the Bishop encourages students at Magdalene College, Cambridge, of which he is Master, to do, although he acknowledges that it’s more difficult nowadays as there is much more focus on getting a good degree. After Cambridge, it was off to Oxford to complete his doctorate before then teaching for two years at the College of the Resurrection at Murfield. By 1977, Bishop Rowan was back in Cambridge, having been ordained Deacon. As part of his student experience, he spent some time in a parish in Liverpool, which including one of the city’s worst council estates. The Vicar there said to him that “these people have doors slammed in their faces every day of the week. I want to make sure they don’t have another one slammed on the seventh day”. That vision of the church ‘being there’ and being accessible has been central to his life and work ever since. The church, he says, must be open to anyone who needs it, even if they never actually come to Christ. In 1986, at the age of 36, Bishop Rowan had travelled back to Oxford, to become reportedly the youngest professor at the university – a urban myth he says. But then in 1991, life took a different turn when he was elected Bishop of Monmouth. Friends and colleagues had suggested he should take up the post and he says he had been thinking for a while that ordained ministry should be more about college life, or being Canon of Christ Church. 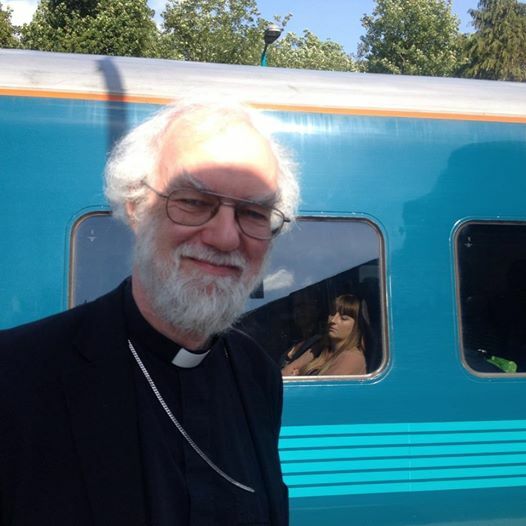 He sees his greatest achievement as Bishop of Monmouth and subsequently Archbishop of Wales as encouraging Christians to think of bringing their faith and worship to people in a different way. This was to manifest itself further when he became Archbishop of Canterbury in Fresh Expressions and pioneer ministers in the Church of England. He sees his time as Archbishop as one of highs and lows. He travelled a great deal, and feels privileged to have done so, and was able to put people in contact with each other when they needed to be so. “For instance, I was able to take an African bishop in to meet a Foreign Office minister and say, tell him what you’ve told me, so that the minister was able to get a clearer picture of what was going on,” he added. He also saw the good which social media can do, citing the case of young people in Christchurch, New Zealand, who put a message out on Twitter after the devastating earthquake which say hundreds of volunteers assemble in the city hours after the call went out to help with the clear-up. It was, he agreed, a positive use of the internet which can be used for so many negative things. Asked what he least like about being Archbishop of Canterbury and he has to think, before volunteering that one of his least favourite parts of the job was the General Synods, which he found frustrating. So, after 10 years, he stood down from the job and admits that he felt the weight of the world lift from his shoulders as he walked out of Lambeth Palace for the last time. But he’s not resting on his laurels. His entry in the Register of Interests in the House of Lords lists 55 positions he holds, ranging from President of the Royal College of Church Music to President of Help the Homeless. He thinks that list is a little out-of-date now as some of these positions come with being Archbishop of Canterbury and says that one of his prime interests is being Chairman of the Board of Trustees of Christian Aid. Other subjects touched on included whether food banks were an indictment of our society – the answer to which was ‘yes’. Bishop Rowan went to say how he often talked to people about how quickly people get move from being self-sufficient to needing help from food banks. He cited the case of a woman who lost her job as a cleaner and whose partner fell ill so that he couldn’t take their children to school. The woman missed an appointment with the benefits office because she was taking the youngsters to school and was subsequently ‘fined’ by having her benefits cut for six weeks’. Whatever you think about the benefits system, he said, that left that family in need. Bishop Rowan spoke also about the benefits of a permanent Diaconate. ‘We should think of Deacons not in terms of what they don’t do, but in terms of what they do,” he said. Other topics included prayer, 3,000 years of Christianity and his poetry. He is writing more poetry now, something he does by hand rather than on a computer – although he did confess earlier that he does now have an iPad. Poems, he says, come to him in all sorts of ways – very, very occasionally they will ‘arrive’ fully formed and it’s almost like taking dictations. Other times he will be asked to write a poem on a specific subject, or he will get an idea from something he says, or from a metaphor he hears. At times he will write three lines, but not come back to it for six months, while at others he will start a poem but never finish it. After the question and answer session, it was outside to the courtyard for a glass of wine and a chance for the audience to chat to the Bishop. And the cheese mentioned right at the beginning? Well, there was a cheese and chocolate moment at the end of the formal part during which the Bishop was asked either/or questions. The answer was cheese. We mark Friday June 11th the feast of St Benedict with a Holy Eucharist at 8am. 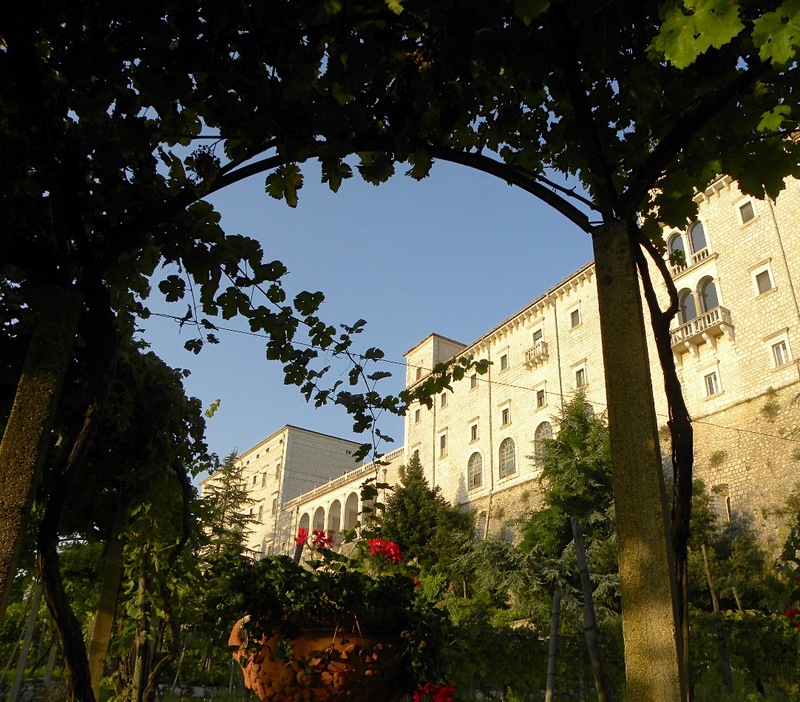 Fr Mark will visit St Benedict’s tomb and his first Monastery at Monte Casino in October, the 50th Anniversary of Benedict being declared Patron of Europe by the Pope.